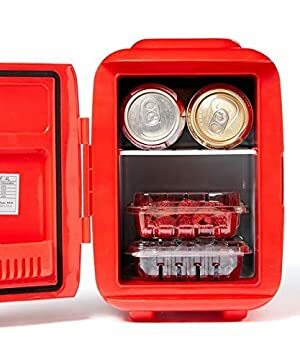 • Mini car fridge thermoelectric cooling system..
• Works by transferring heat from one side of the device to the other along with electric energy..
• Easy to switch from beverage cooler to food warmer!. • Capable of holding six (12 ounce) drinking cans..
• Environmentally friendly, 100% safe and Freon free. • Lightweight sturdy polypropylene (PP) plastic design with magnetic self-lock latching door. • Also suitable for use at homes, offices, dorms and so on..
• Comes with AC, DC and USB power cords for easy switching from standard (110V) to car (12V) and to USB 2A power bank. • Quiet operation, compact and sleek enough to put on a desk at work..
• Comes in 5 different colors: white, blue, pink, fuchsia and cow pattern..
• Note when using USB power, the Cooler/Warmer will only operate in ECO mode. • Not recommended for computer use as it may not generate enough power..
• Capacity: 40ºF-45ºF (Cooling) / 122ºF-144ºF (Warming)..